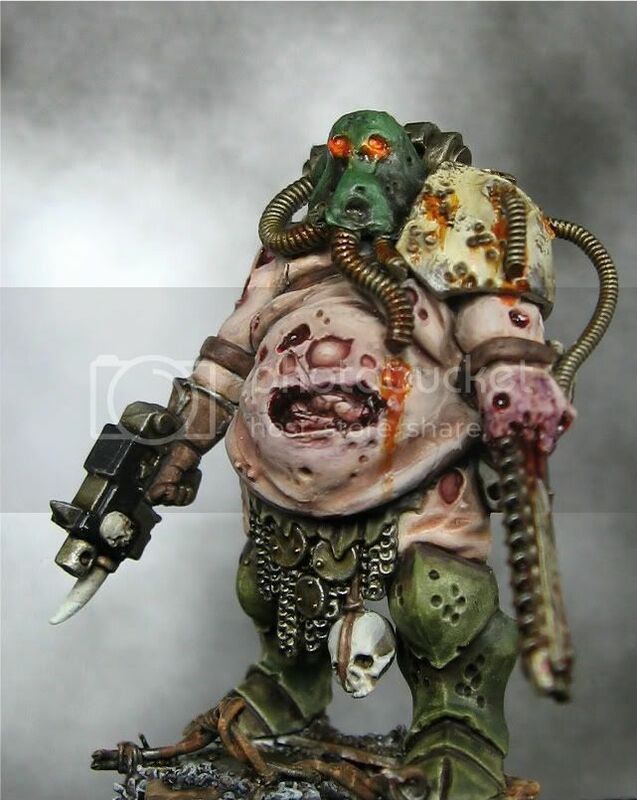 I've finally settled on an acceptable paint scheme for my Apostles of Contagion. It may not be everyone's favourite, but I am happy with it. It is fast, provides decent shading and highlights, is not bright green, and matches the asthetic I wanted with my death guard. These models are still a work in progress. I have only painted the armour so far. I will still add blue glow to the eyes, detail on the bases, and paint the fungus areas and boils. Only five of my eight models survived the colour scheme attrition... They will get painted with the next batch. 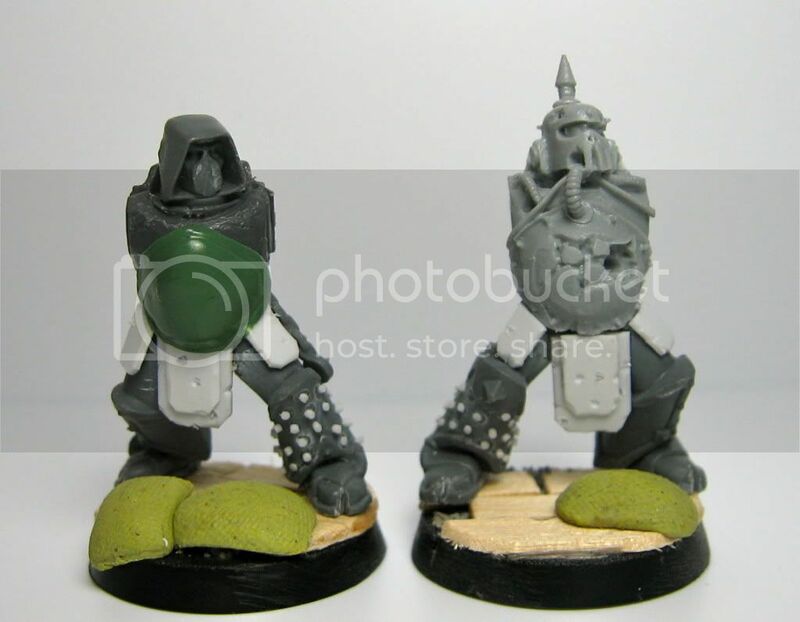 I used my airbrush to zenithal highlight to the step you can see on the model on the right. I then sponged and stippled the rust in four layers and washed most of the model is Gryphonne Sepia (I need to get some more pots of this before the paint colour change!). Now I need your help. I need to paint the fungus (washed with Leviathan Purple here) and guts. What colours should I paint them? 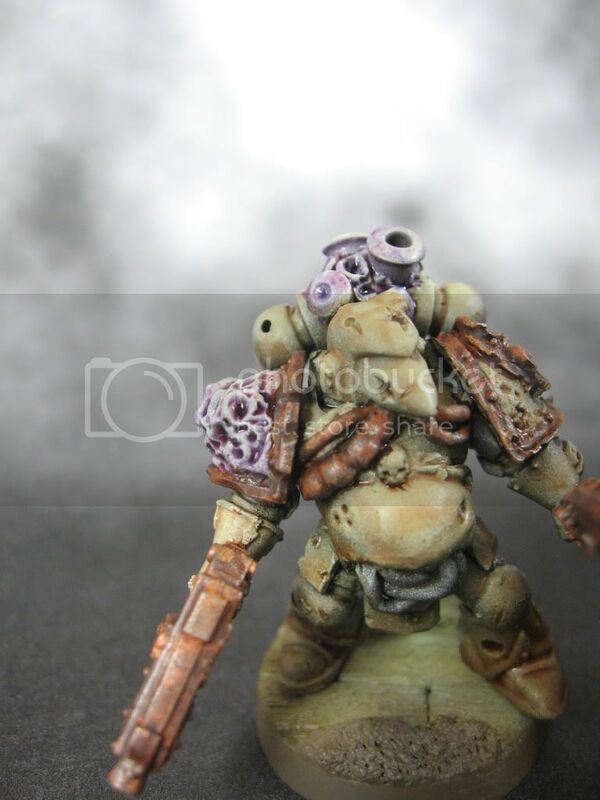 I want a purple-ish/pink tone but I don't want it to overpower the muted models. Any ideas? Links to good pictures or tutorials? I could really use some help on this one! Thanks are due to Matthew from Midwest Monster Lab for his feature on Rust and the City this week as the March Mad Hobbyist. If you haven't already visited, definitely check out his blog. He has lots of really creative conversions, great painting, and nice tutorials. He is currently working on an awesome greek mythology themed undead army. Welcome to newest followers Monty, Strider, and RebelGrot. Seven more followers and RatC will have hit the magical 100 followers mark! Thanks for visiting. Have a great weekend. 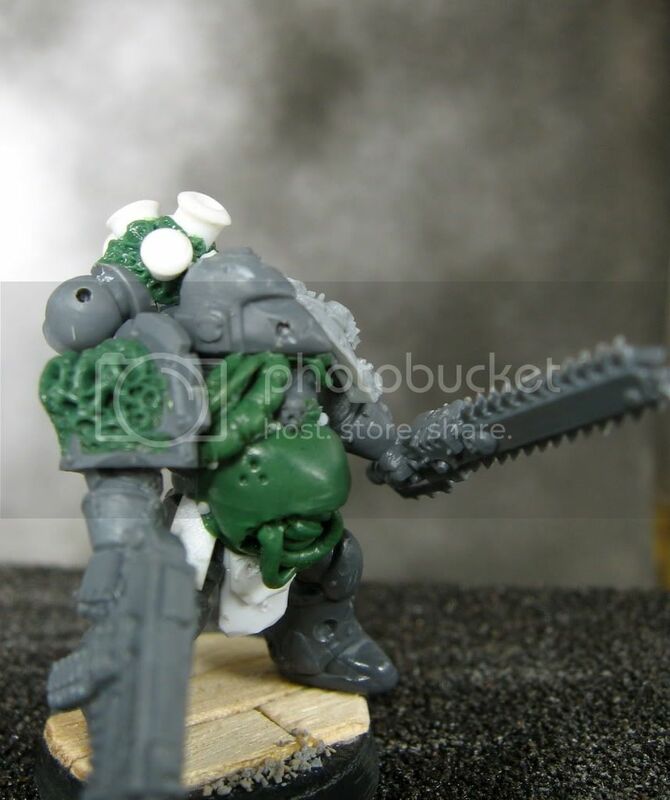 There is this idea floating around that painting nurgle is quick and easy. Just slap on some greenstuff, glob on the greenpaint, and call it a day. 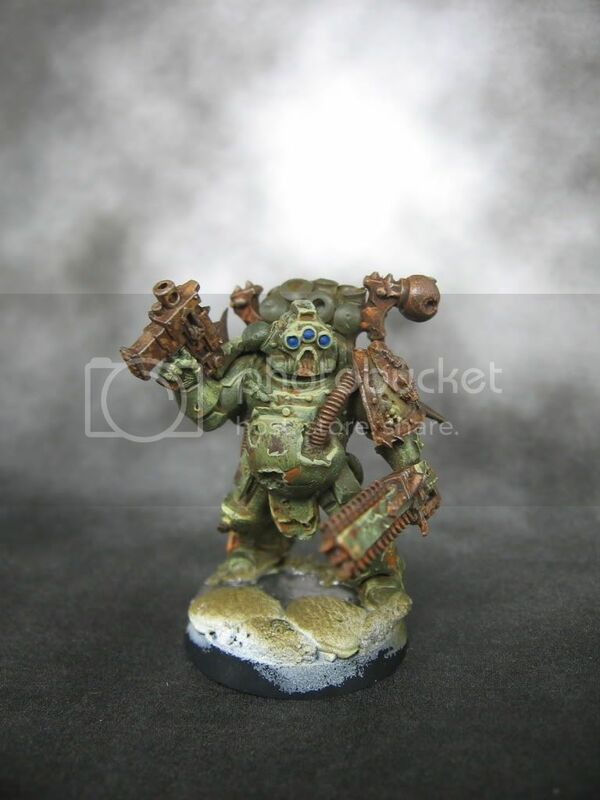 In fact, this is one of the things that attracted me to making a death guard army. I thought it would be quick with few models to paint. Little did I know I would spend months struggling to find a colour scheme and painting style I was happy with. 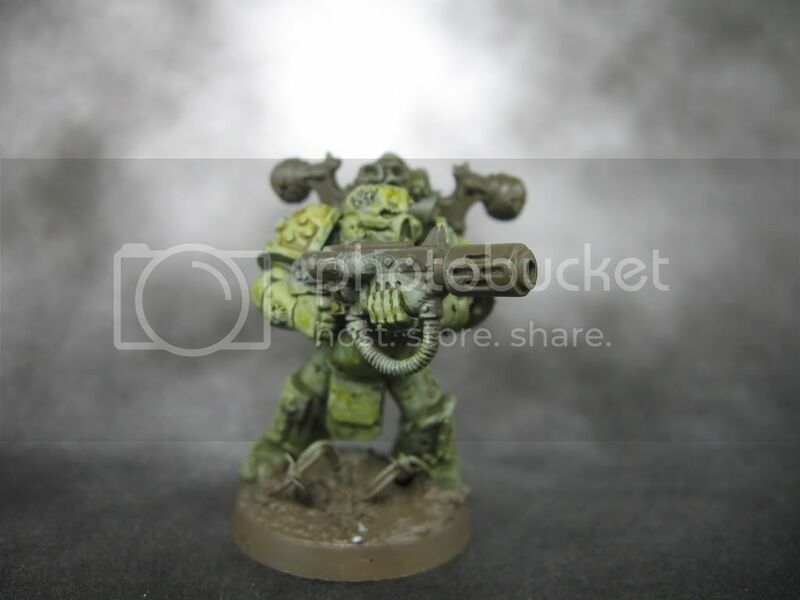 The pictures above and below show the model I have partially painted as a test of this colour scheme. I airbrushed Vallejo Model Air Olive Drab and the dry brushed layers from catachan green up to rotting flesh, line highlighted in places, then washed with vermin brown and devlan mud. I added some battle damage with paint and painted the rust with a stippling technique. I still need to make the eyes glow, paint the flesh and skulls, and paint and flock the base. So this model is definitely a WIP. This neon green abomination was painted today too. Horrific. I'm glad I decided to test this scheme out before doing it to a whole squad! You could put this picture under "garrish" in the dictionary. Feedback on the incomplete test model above would be great. Too bright? Too dark? Boring? Sloppy? Crisp? Comments and tips would be greatly appreciated. Thanks! 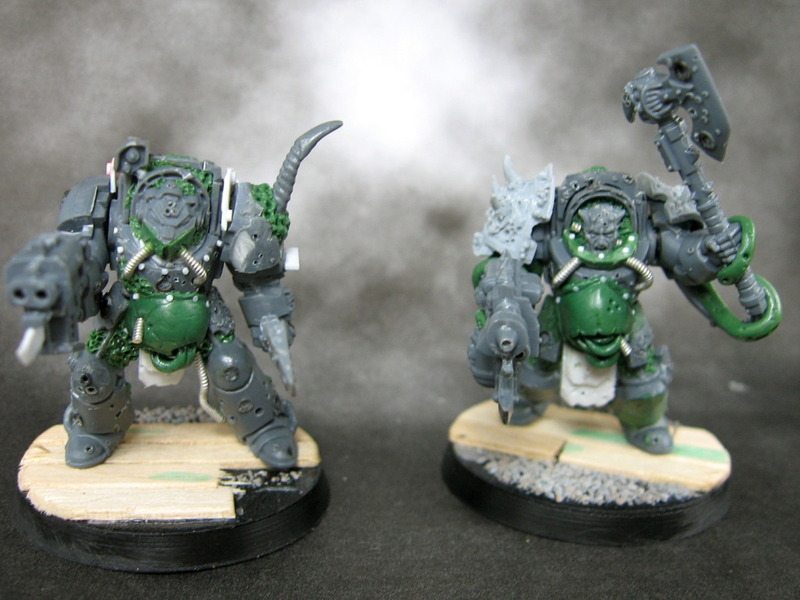 After far too much work I have another four plague marines converted and ready for paint. 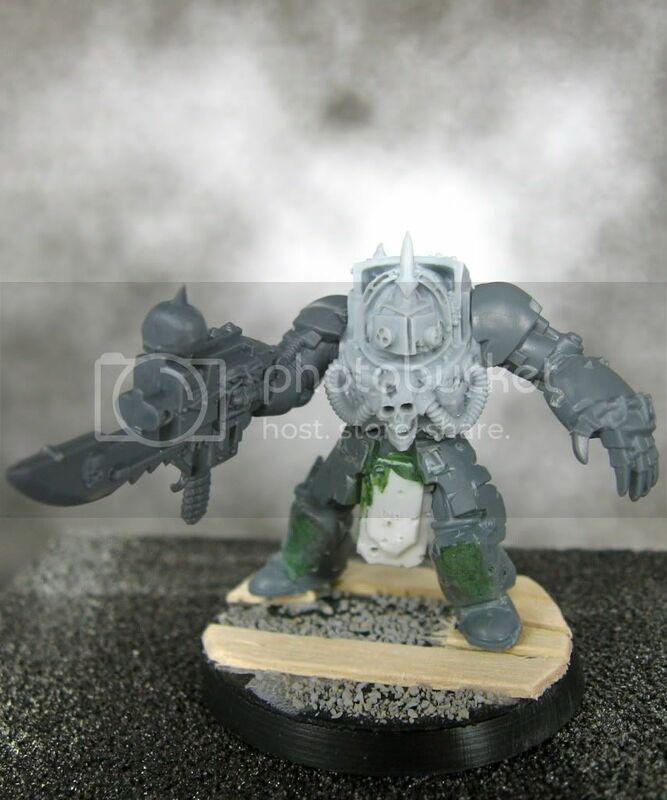 I keep justifying all of the conversions and sculpting as each part is relatively quick. In the end though it is taking me probably a few hours in total for each model to base, clean mould lines, assemble, greenstuff, add rivets, add cables, and add battle damage. 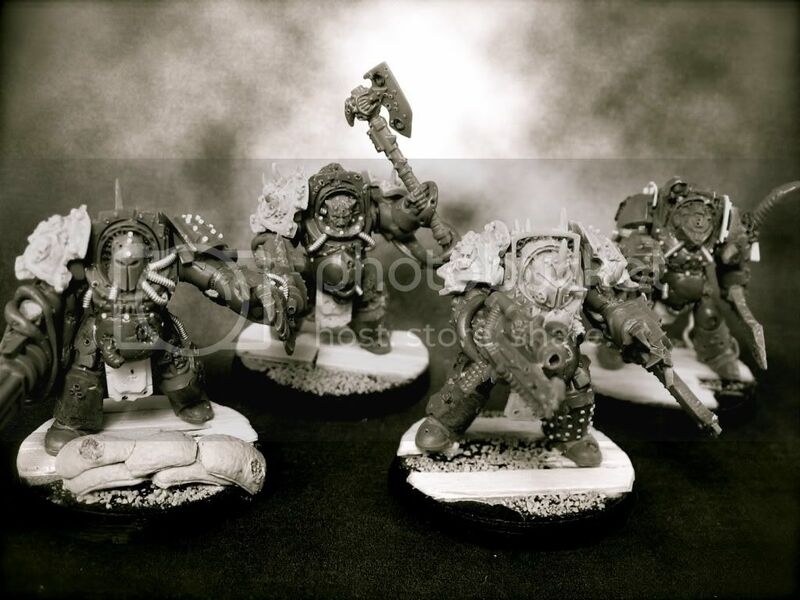 With these four models I now have 11 plague marines built, 1 dreadnought, 4 terminators, and 1 demon prince. I still need to assembled another 10 plague marines, 3 terminators, and 2 obliterators for next weekend. Ahhhhhhhhhh! 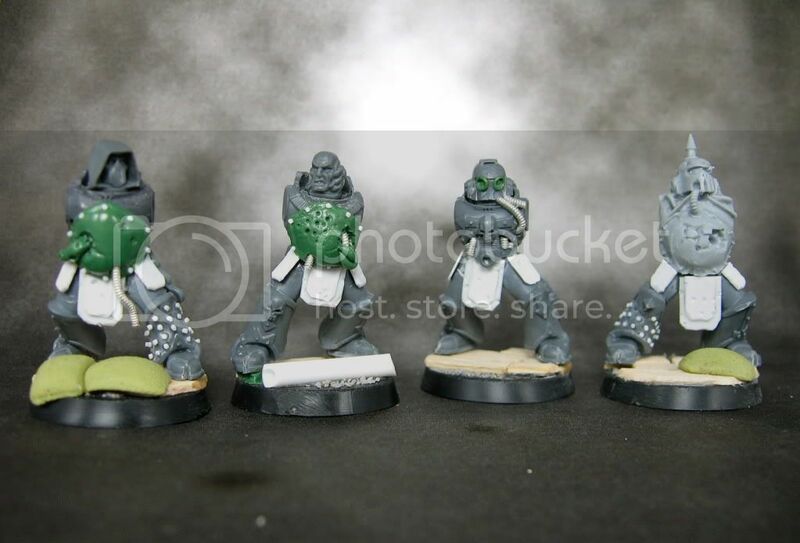 Does resin, greenstuff, and grey plastic count as the three colour minimum? Here are the four I converted this time. One with a melta, the rest standard. I added mud to the bases of the whole army. Sand and glue. 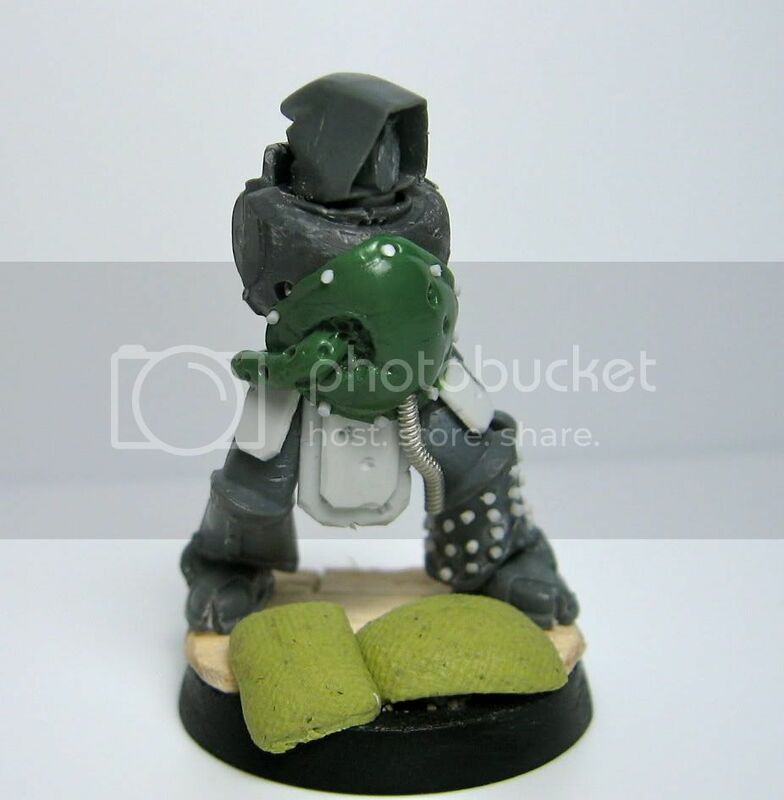 I tried sculpting a few different gas masks based on marine heads. Sort of happy with this one. 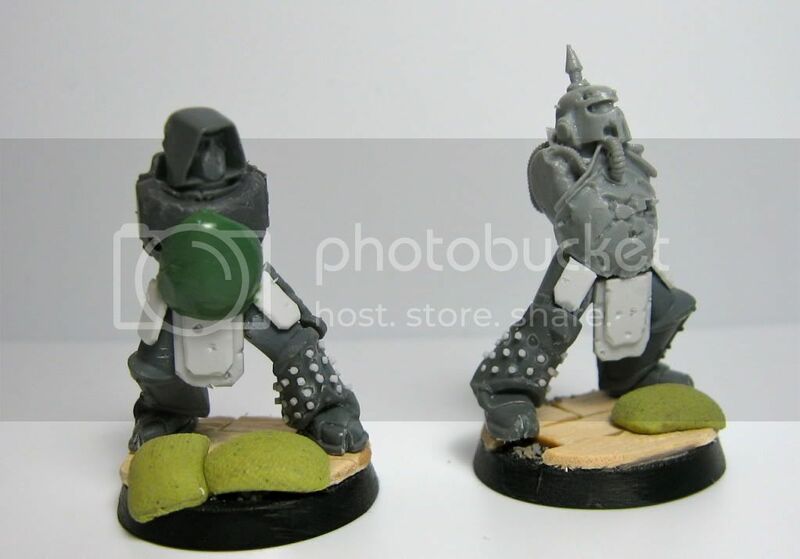 I also added cloven feet to these models. I am most pleased with these two. Gas mask on the left turned out better than I had thought it would. I almost took the head off a few times as I couldn't figure out how to make it match. 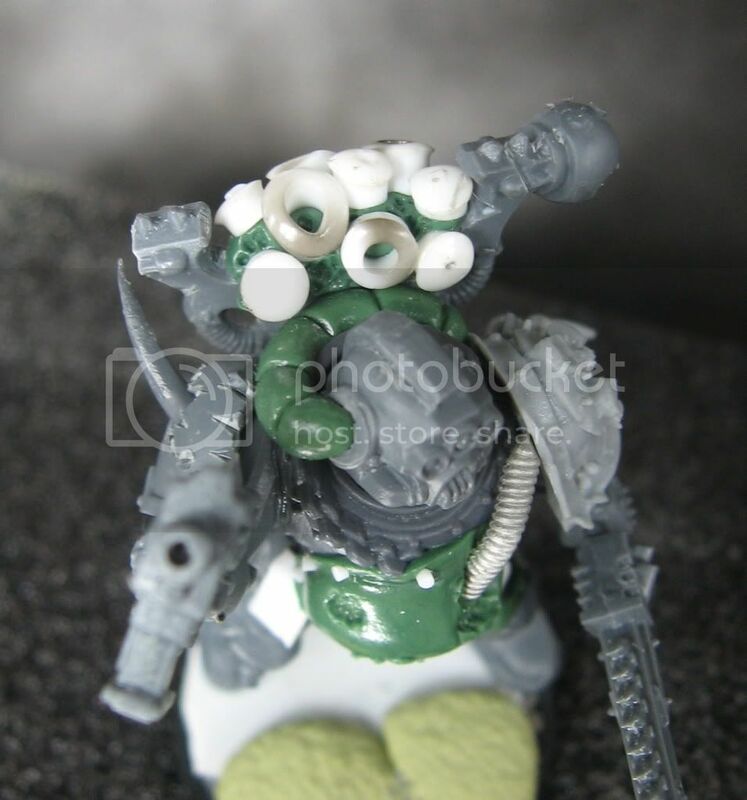 This plague marine got an extra special backpack too. I am pleased with the lenses on this model too. Now onto painting! At last! To see how I sculpted the bellies, check out last weeks tutorial. Thanks to Santa Cruz Warhammer for featuring me on the honour roll last week. Thanks to Dark Future Gaming for the very complimentary feature. 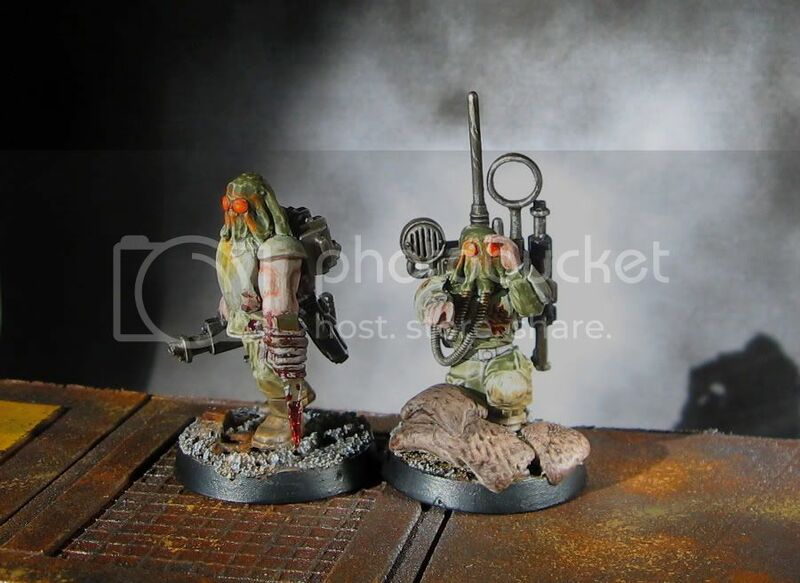 I'm really flattered that people have been enjoying these conversions. Thanks to everyone who has been commenting on my work! 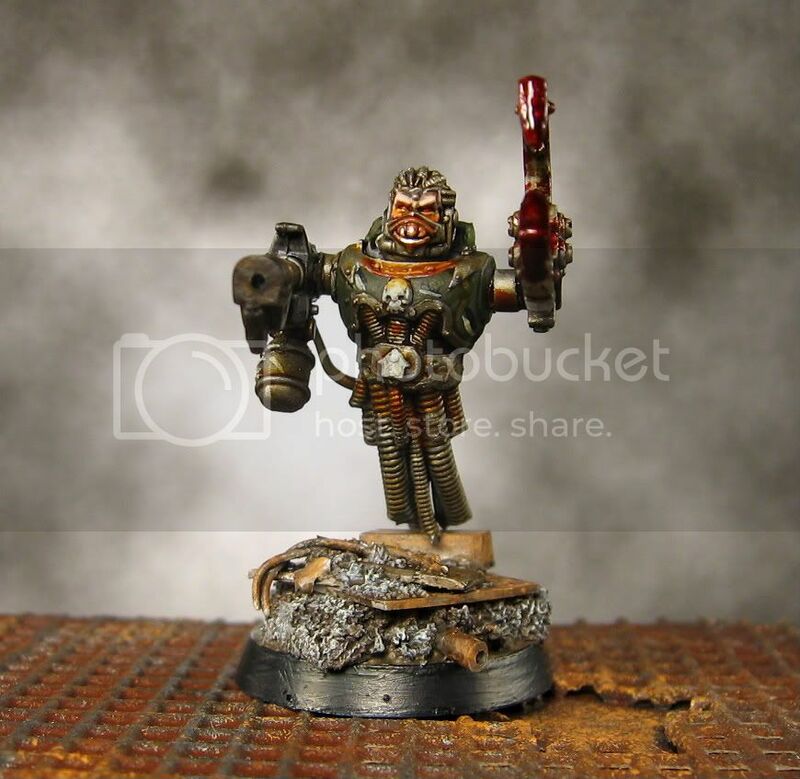 Welcome to the newest followers Ghostin, Chris, Tim Toolen (check out his excellent blog Miniature Tim), Lord Shaper, Wienas, agemmanjw, GreatGunz, Sidney Roundwood, and Lead Legion. Check back later this week for painted Death Guard (for real this time!) and my completed Demon Prince. Thanks for visiting! Hasta proxima. 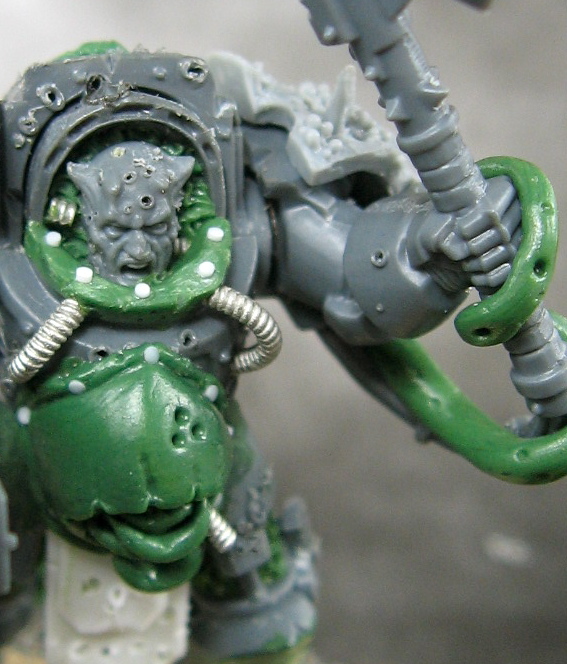 This tutorial will explain step by step how I sculpt bloated nurgle stomach armour to match the Forge World Death Guard models. The Forge World models are great, but there are only ten poses and I like converting models. Therefore, I have been trying to sculpt my own stomachs to match the asthetic of the existing models and add some character and variety. 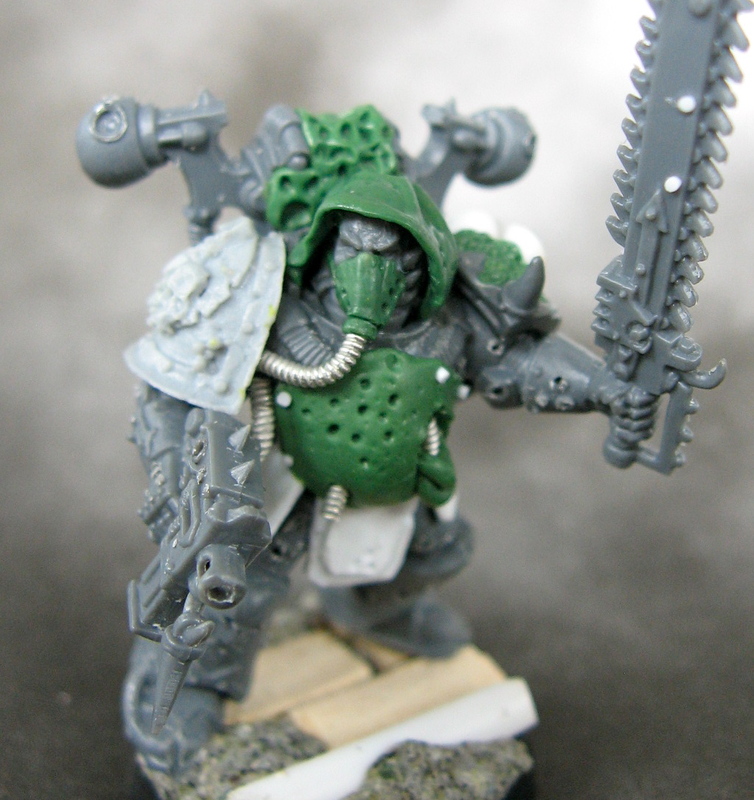 I will add more parts on how I add rivets and make the metal tabards in another post. 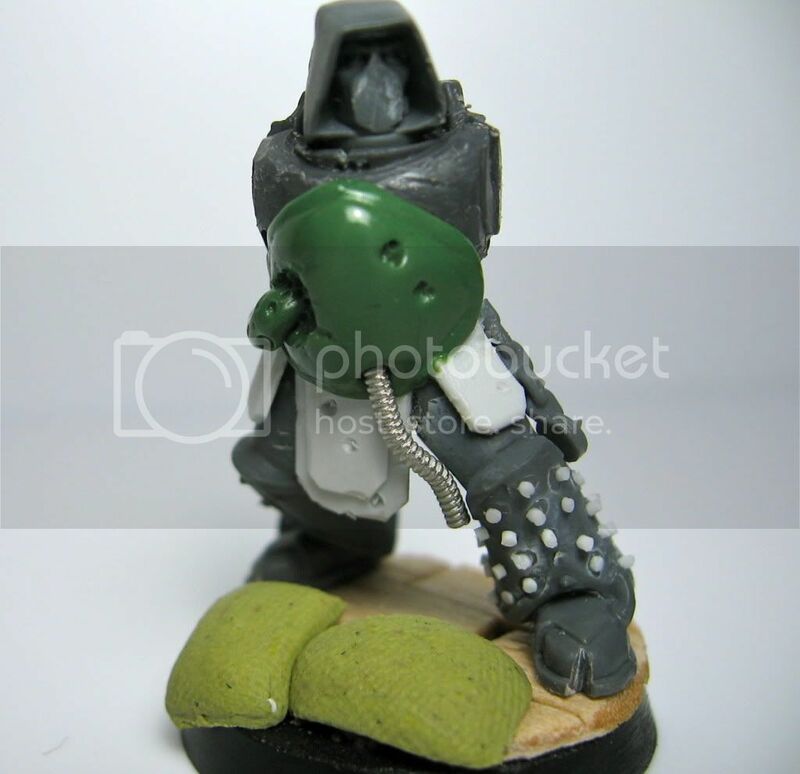 You will need greenstuff (or another similar product), thin plasticard rod (for rivets), a model, lubricant (I use chapstick) and sculpting tools (for this model I used the GW sculpting tool, a chisel colour shaper, and a pointy rubber tip). I used the colour shaper on the left, red tool in the middle, and the tool on the far right. 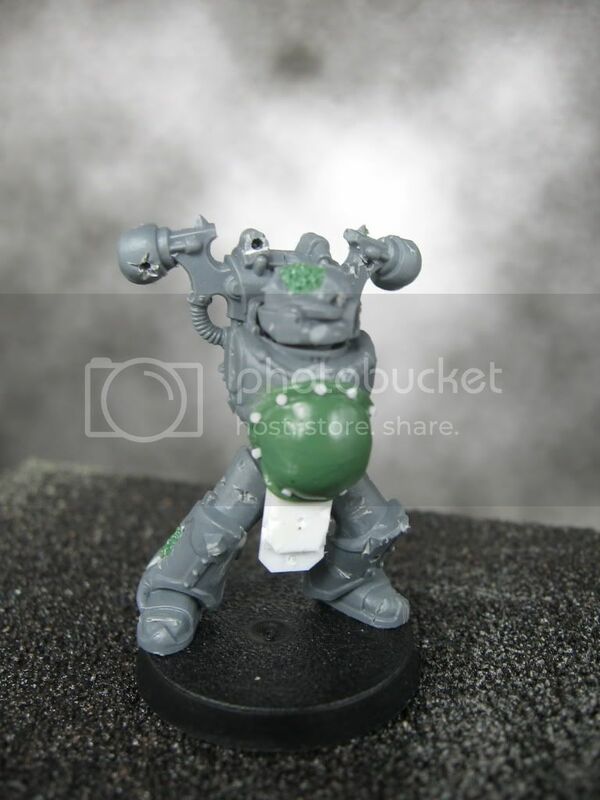 Step 1: Add a blob of greenstuff approximately the same size and volume as the resin Death Guard's belly to a model (it is easier to do with the arms unattached). Step 2: Using some chapstick (a tiny bit) and the metal tool, start creating the basic shape by gently stretching the edges outwards to match the shape of the Forge World model. Compare to original. Step 4: Use the tool of you choice to create a thin line about 1mm from the edge of the sides. Don't press hard, just draw a thin line. Then use a flat tool to gently smooth in both directions around the line (ex. smooth from the line to the margin and from the line to the center). Step 5: Add damage. Now we get to be creative and add damage and detail. 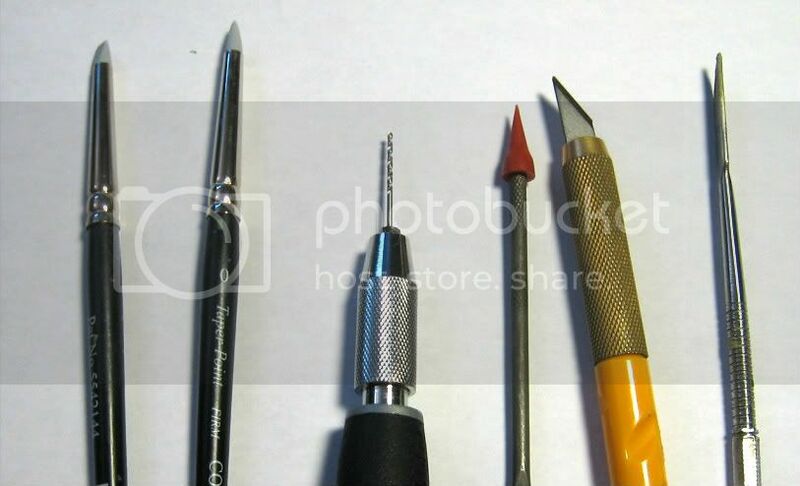 I started by poking some holes using the rubber tipped dental pick. Step 6: Make the hole deeper. Add cracks around the edges. Add detail inside. Use a sharp tool to carefully make the edges pull outwards. Be careful during this step that you do not change the shape of the belly too much. Step 7: Add details like intestines, cables, holes, cracks, tentacles, etc. Be creative! Have fun! This is a hobby. Go crazy! Step 8: Cut some small pieces off of a thin piece of plasticard rod. You will need 8-10 little pieces. 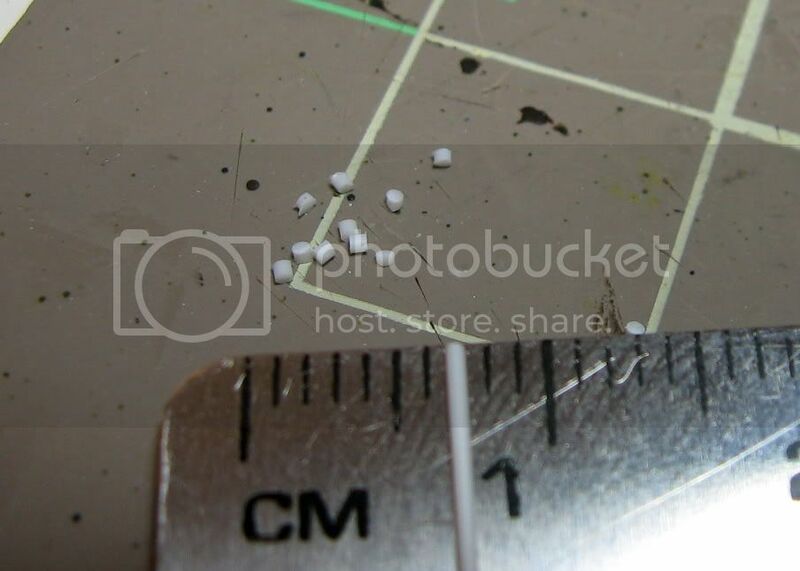 Each should be about 1mm long (smaller is better). Step 9: Pick up each rivet using the tip of a hobby knife. Carefully push it a tiny bit into the greenstuff. You have a rivet. Repeat at regular intervals around the edge of your belly. Step 9: Leave your model undisturbed to cure for a few hours. 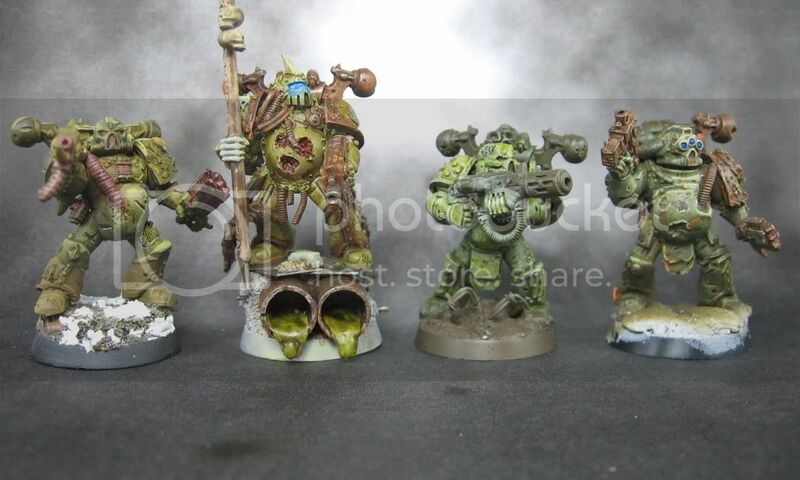 Here you can see a comparison between a few other work in progress models and the original Death Guard model. That's all there is to it. 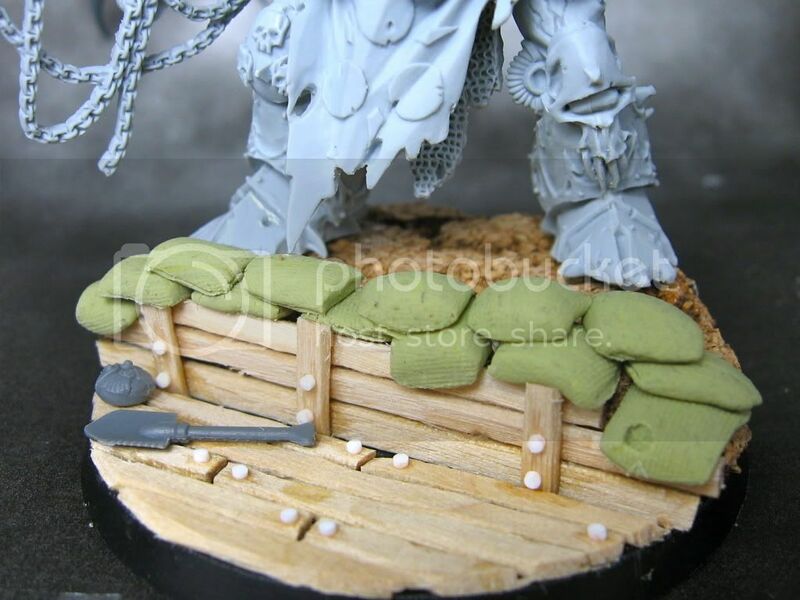 I will add some more tutorials on how to add fungus infections to your models, how to add rivets to hard surfaces, and how to make plasticard armour in the future. Please post links if you try these techniques yourself and I will include your pictures in the blog. Thanks! I've finished the assembly of the Nurgle Daemon Prince to lead my Death Guard army. The model is the excellent Daemon Prince in finecast. Ironically, the HQ will probably be the least converted model in the whole army. 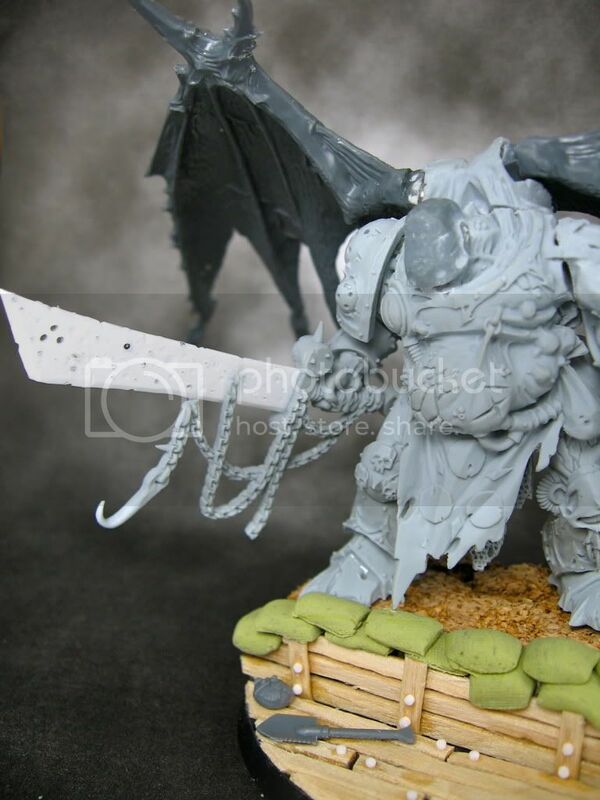 The only conversion work so far is the magnetized wings (from the Chaos Manticore), a new head (filed down Ogre Kingdom Head, will get a gas mask sculpted), a plasticard sword, and a custom base. I still need to add some greenstuff before this conversion is finished. This model was my first finecast experience. 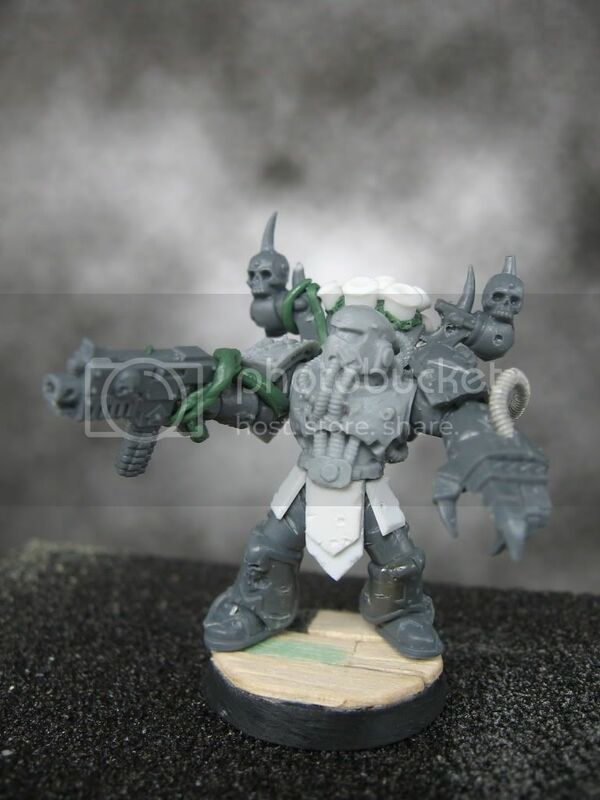 I had heard lots of finecast backlash online but there is no way I would have bought this model in metal. I hate working with metal models and this models would have been difficult to assemble with all of those heavy components. My first experience with finecast was very good. The mould lines and flash were pretty minimal and were easy to remove. 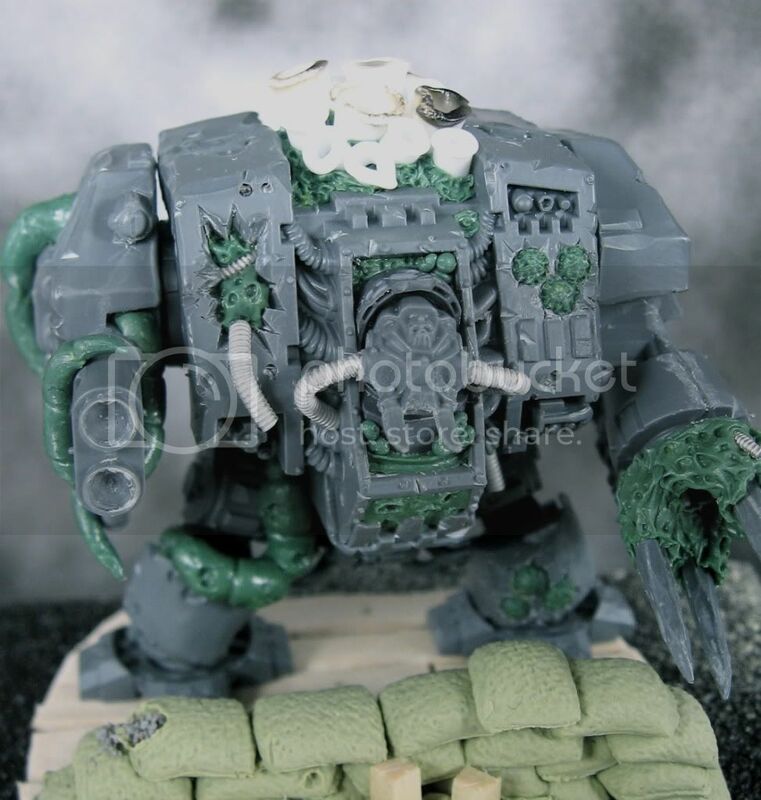 The level of detail was excellent and I couldn't find any casting bubbles or imperfections (granted, this is Nurgle so it might be hard to know what was intended or not!). The only imperfection was that the sword was slightly bent (as were a few little horns on the legs and back). I removed the sword because I dislike the shape, not because it was crooked. The finecast was easy to put together. The joints fit together pretty well and I assembled it without pins (except to attach to the base). There are some gaps that will need filling but that is inevitable with a multi-part model like this. I definitely prefer all plastic models over every other option. I find the prices for Finecast models is pretty high. 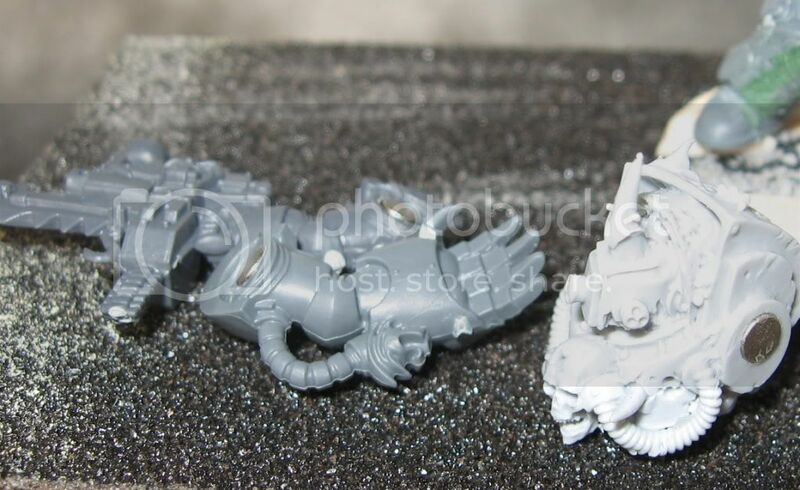 Based on quality, detail, and easy of assembly and conversion I will be happy to buy necessary models in finecast in the future. Sword is made from plasticard with lots of holes drilled in it. The wings are magnetized. I will be blending the joint together with greenstuff. I wanted a base the made the model a centrepiece and had a bit of a diorama feel to it. The daemon prince has landed above a little Imperial Guard firing point and has scared off the guardsmen. Eventually I will add some mud and snow, possibly with footprints leading away from the trench. Thanks for visiting! I should have the greenstuff done in the next few days along with four more plague marines that are currently in progress. 18 days until the Trumpeter Salute tournament I am trying to get my force somewhat ready for. I submitted my army list the other day. I am not entirely happy with it as I think it needs some vehicles to be a bit tougher. However, it does minimize the number of models I need to assemble and paint and the number of vehicles I need to buy (I still need to find 3 rhinos, the store had none when I went in today...). Started on a demon prince. Lots of work still to go on this model. Here is the list as it stands. This is 1,498 points (tournament is 1,500). I took many of the comments into consideration. The poll results were decidedly in favour of painting cool models and adding some heavy support. 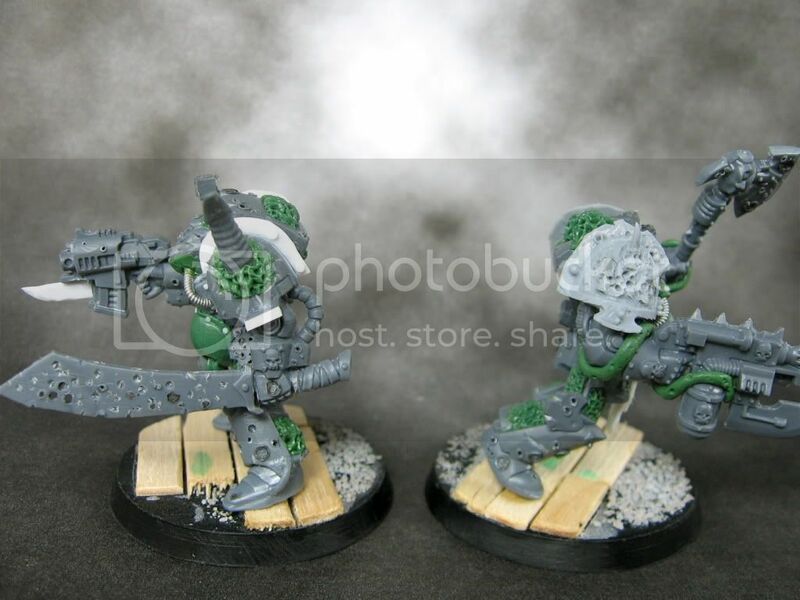 I had some ranged support in the form of obliterators. 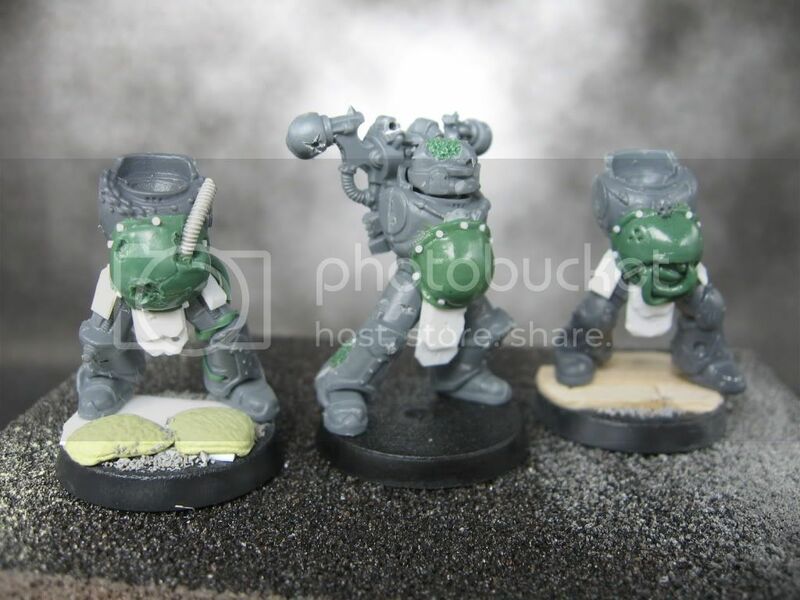 The general plan is that the plague marines with plasma guns will go for close objectives while the two squads with some melta contest further objectives and try to control the middle of the board. 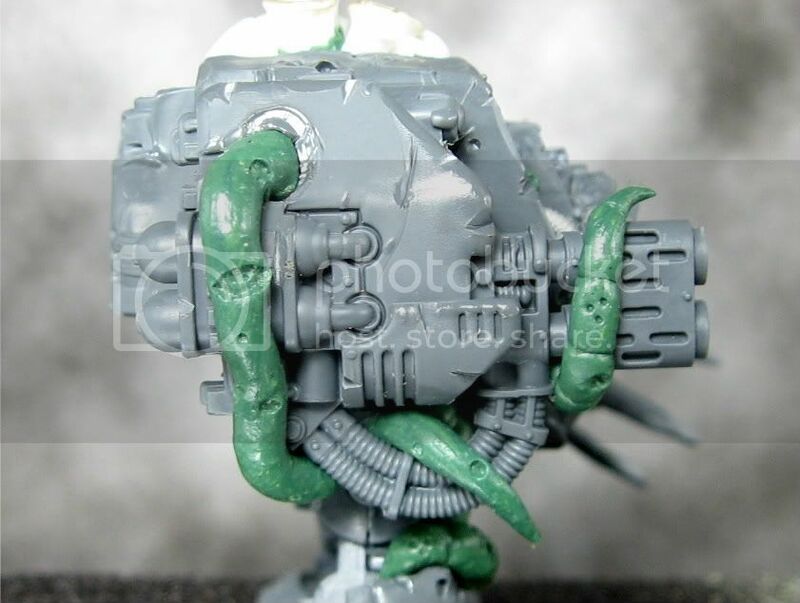 The terminators will deep strike and either threaten tanks and small units in the rear or will deep strike onto the icon on the plague marines to support the center. The Obliterators and Dreadnought will provide some heavy support. 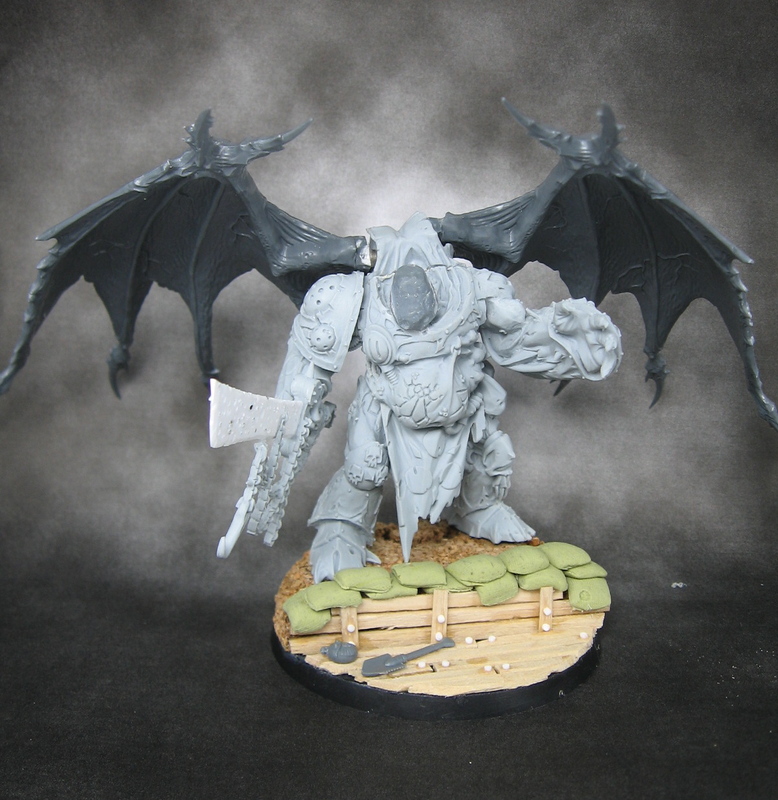 The demon prince will draw fire and try to support plague marines that are threatened by units in close combat. 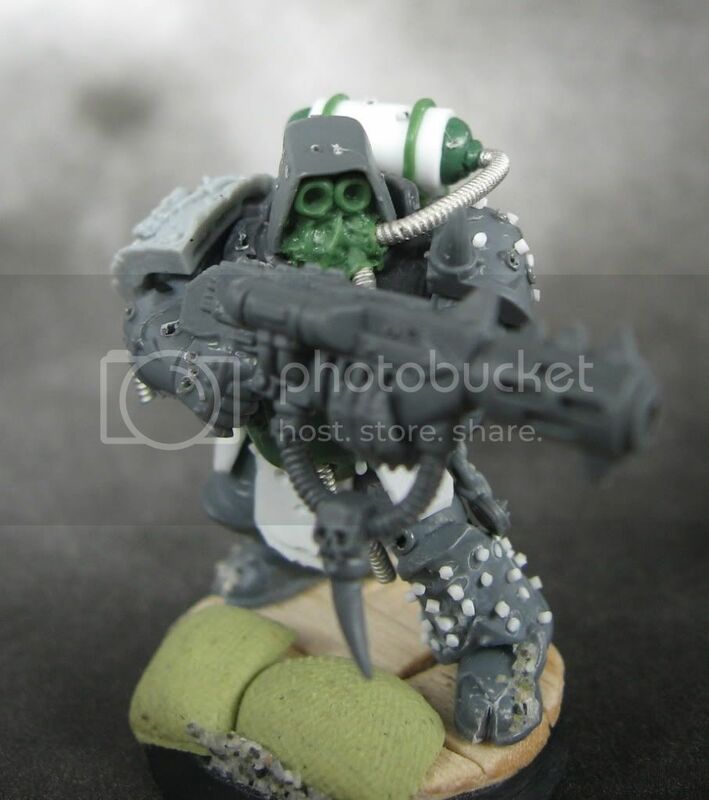 The list is really just built around the plague marines trying to take objectives and being hard to kill. 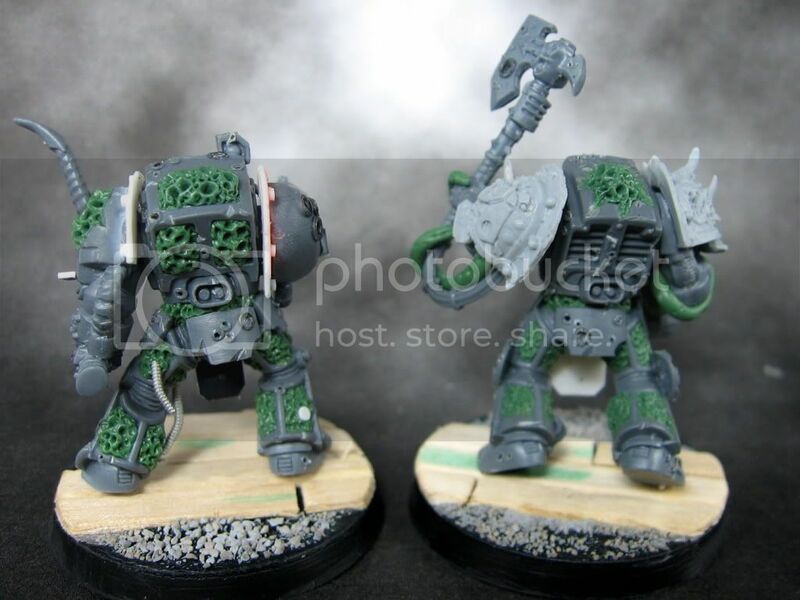 I know terminators and dreads aren't too popular competitively, but I really wanted to include them. This list is a pretty low model count and there isn't too much firepower. I think this list will struggle with really tough combat units, heavy tanks, and hordes. C'est la vie. I can't change the list now, but any tips on ways to play it and strategies to use would always be appreciated. I am totally new to actually playing games of 40k (although I have played fantasy and skirmish games a lot). Welcome to the newest followers; leadlegion and MWC. Thanks for visiting. It is day 16 and I have finally finished (mostly) converting four Terminators for my Apostles of Contagion force. The models are made from a mix of Forge World Death Guard parts, Chaos Terminators, Assault Terminators, Grey Knight Terminators, and Assault on Black Reach Terminators. Plus some greenstuff, plasticard, Warriors of Chaos and Ogre bits for good measure. I am quite pleased with the belly armour and head on this one. Still need to fill that little gap by the cable. 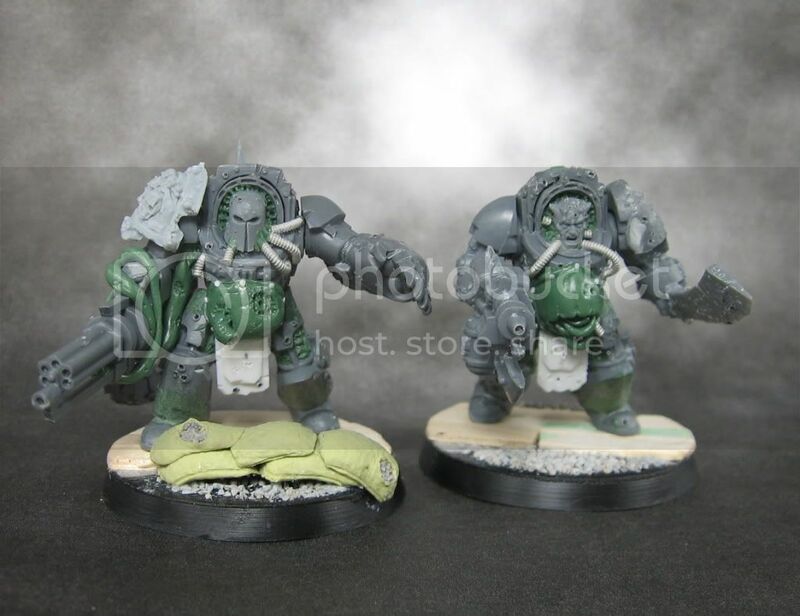 Reaper autocannon with power fist and combimelta with chainfist. Notice the studded shoulder pads and leg guard. I am quite pleased with these. 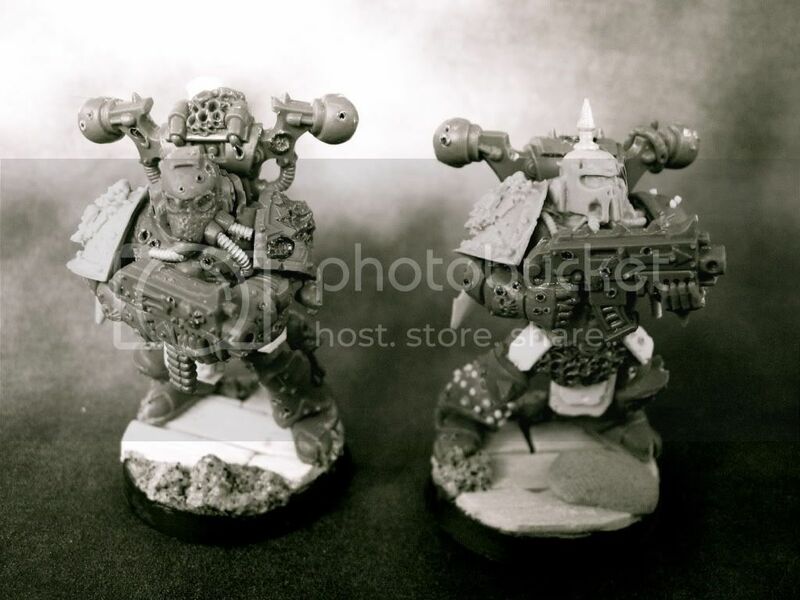 Bolter and power weapon, combiflamer and power weapon. I need to finish converting the AoBR shoulder pads on the left terminator. It was great fun sculpting this mess on the back. Big sword for good measure. 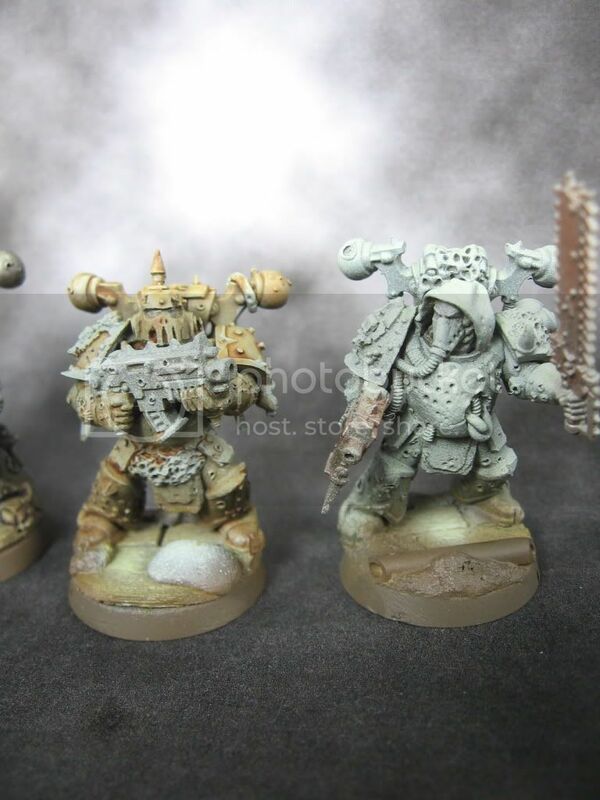 I just have three more plague marines to build up and then I will begin painting in earnest. Welcome to Keith Chamberlain, the newest follower. 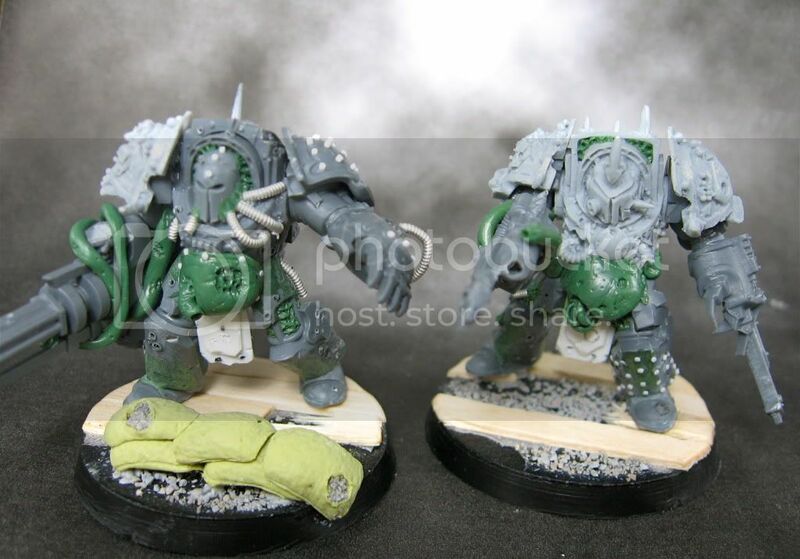 Check back next week for some plague marines and (hopefully!) some painting progress. Thanks for visiting. Hasta proxima. I've been doing a lot of sculpting on my death guard recently and thought I would share some of the things I have recently started doing that have been working well for me. This short article will focus on a short review of Gale Force 9 greenstuff and discuss the use of chap stick as a lubricant when sculpting. Gale Force 9 in the tubes. Games Workshop in the battered roll. My milliput and GW greenstuff recently started running low. When I went to my local game store they had Gale Force 9 green stuff. I initially bought it because it was substantially cheaper than the GW alternative. For $20 (Canadian) I got 100 g of putty. From Game Workshop, greenstuff costs $12 for 20 g of putty. To summarize, I got 5 times the putty for less than double the price. No comparison on price. 100g is a lot of greenstuff though. I'm thinking I might cut it in half and store half of it. The GF9 greenstuff is also stored in two separate tubes. The GW putty is in a strip which causes the center of the strip to cure in the package resulting in lumps in the putty or wasted material. The tubes make it easy to keep the yellow and blue separate and make them easy to store neatly. Most importantly, how does sculpting with each compare? Although they look identical, I find that they have slightly different properties. 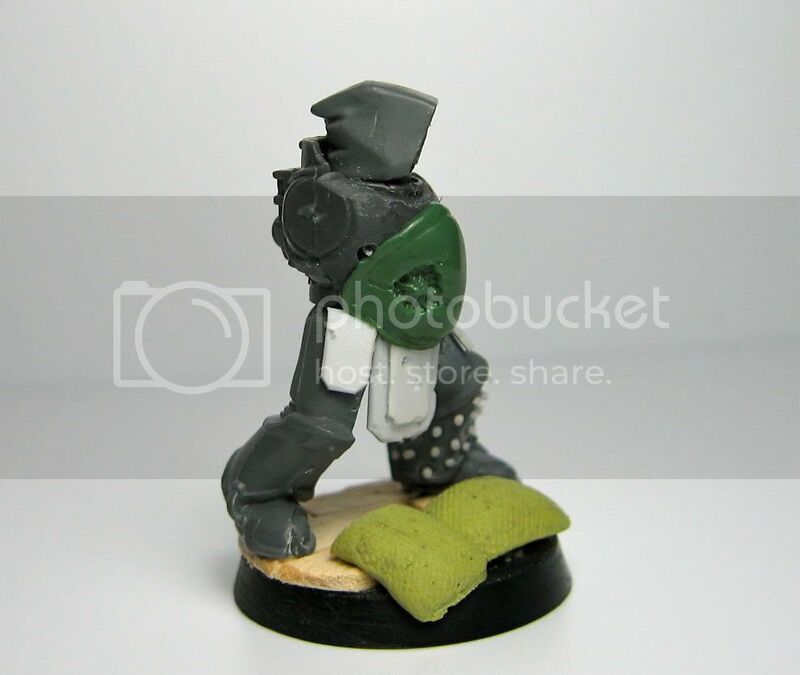 GW greenstuff is more elastic. This can be really useful for some shapes and effects like stretched skin. I have found the GF9 greenstuff to behave more like a mix of greenstuff and milliput. It is easier to smooth and is softer. I have found the working time to be a bit longer too. It holds details and shape very well. The only downside I have noticed is that, like milliput, GF9 greenstuff tends to dissolve in water a bit, making spit a less than perfect choice as a lubricant. Overall, I prefer sculpting with the GF9 putty for most applications where I need a smooth finish. 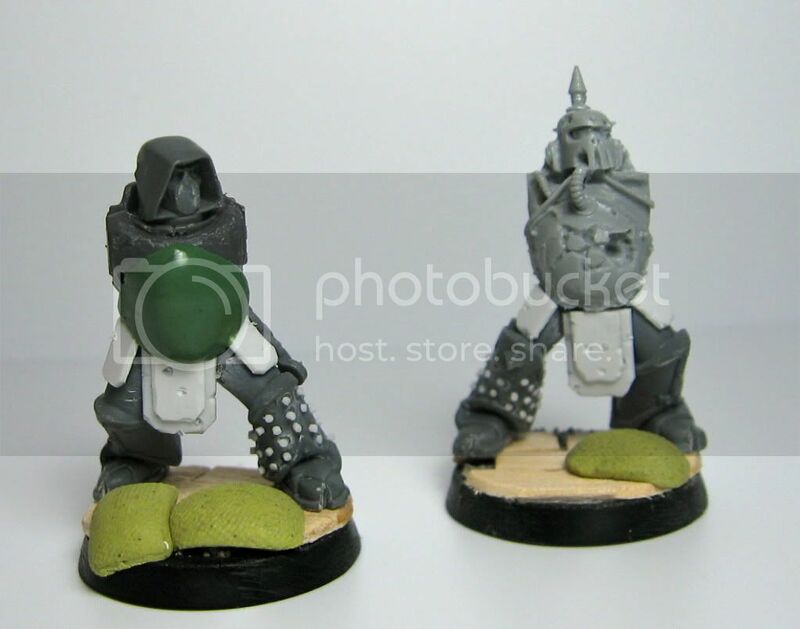 I will probably still use the GW greenstuff for little details like flaps of skin hanging free and maybe other applications where you pull the putty to get the effect. I think I could still do all of this with GF9 putty. In conclusion, if you can find it locally (preferably at your local store! ), I would recommend trying GF9 greenstuff for your sculpting needs. It is cheaper, easier to smooth, and has an interesting smell (it really does! Not bad, just interesting). I have found it overall easier to work with while still holding the detail necessary. 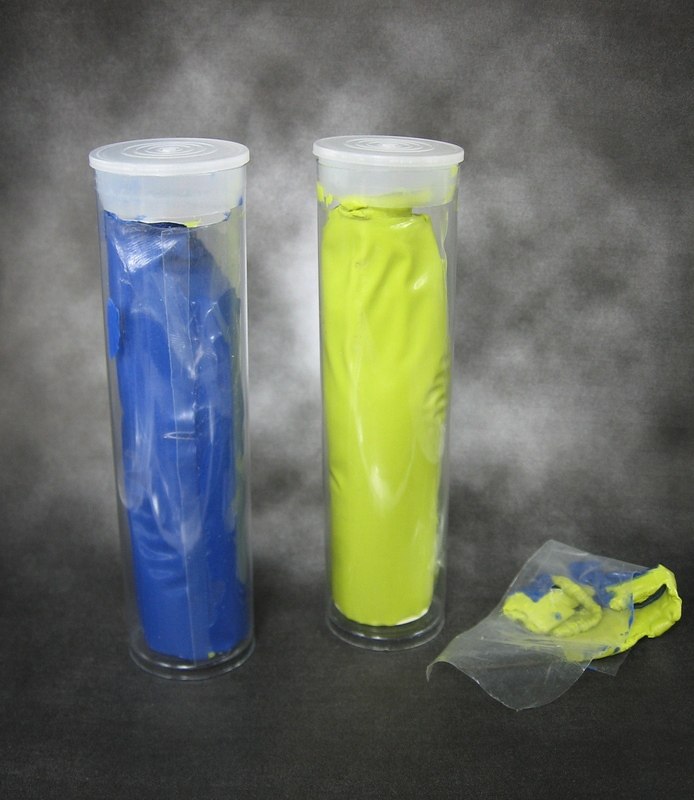 The packaging is much better and the savings are huge if you use much greenstuff. 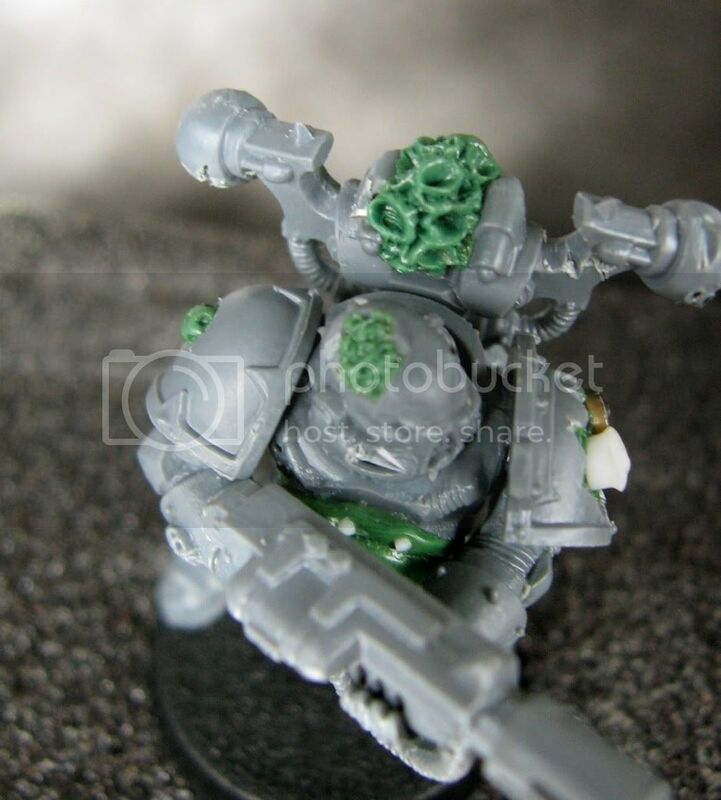 That being said, there is nothing wrong with GW greenstuff. I find it works well when you learn it's properties. I just now prefer the GF9 greenstuff. Gale Force 9 greenstuff. First usage. Terminators. See more of these models tomorrow. Using a form of lubricant is probably the biggest "secret" to getting a good finish with greenstuff. I suspect that many people who struggle to get a smooth finish are not using lubricant. I usually use spit as a lubricant. I spit a little on my left hand and then dab my tool in it before applying the tool to the putty on the model. I find this helps to get a smoother surface and stop the putty from sticking. 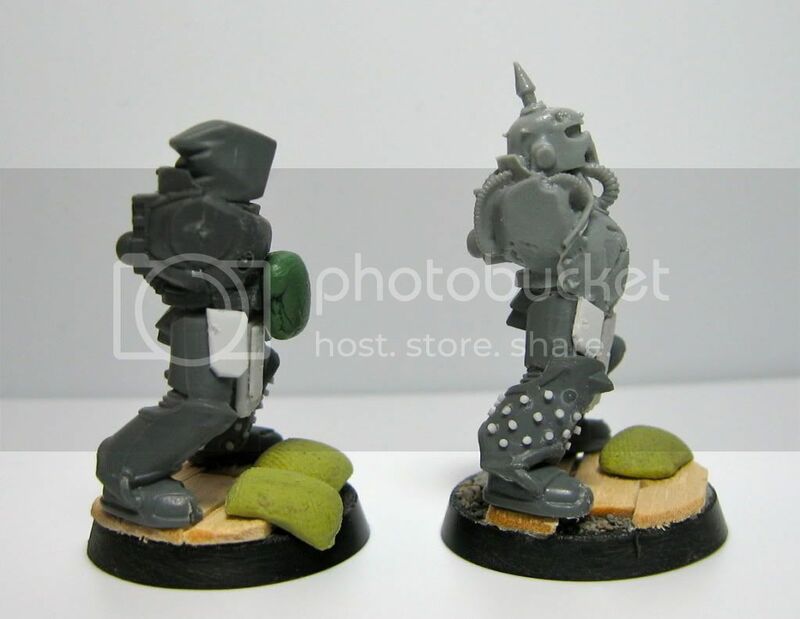 Sculpting the belly plates on my Death Guard models I have had to try and create a really smooth, uniform finish. I had previously used chap stick to stop greenstuff press moulds from sticking. I was making some press moulds and just started using a bit of chap stick to lubricate my tools. When you are doing this you need to ensure that the putty is on the model and that no chap stick is between area you want to stick together (or they won't stick!). The basic technique I use is as follows. I create a blog of putty the size I want. I apply it to the model then use tools to get the approximate shape I want. I then apply a little chap stick onto my colour shaper (a tiny bit, just a thin covering). I then use the chisel colour shaper to smooth the surface, spreading the chap stick as I go. The chap stick allows me to apply very, very light pressure to smooth and prevents tool marks and lines. Doing this slowly and carefully allows me to get a very smooth finish. Finally, I add details using other tools and then go back afterwards to smooth the overall shape and finish again. My biggest concern is that the chap stick could prevent paint from sticking. To this end, I plan to gently wash each model with soap, water, and a toothbrush once the sculpting is complete to ensure that paint can stick. You can see how smooth I was able to get the putty on the stomach using chap stick. I would be interested in hearing everyone else's comments on tips and ways to improve sculpting. If there is interest, I can add some step by step tutorials on how I sculpt some of the details I have added to my models. I am not an expert, but I do really enjoy sculpting and trying to do different things. Sometime in the next few months I am going to try and sculpt a full model from scratch (except hands!). Thanks for visiting. I'll look forward to your tips in the comments! Also, I'd like to start adding some new blogs to the blog roll and getting Rust and the City added to the blog rolls of more sites. If you would like your blog added just drop me a line in the comments section and add Rust and the City to your blog rolls. Thanks! I've mostly finished the sculpting on another three plague marines. I tried to sculpt them to fit in with the Forge World Death Guard models. 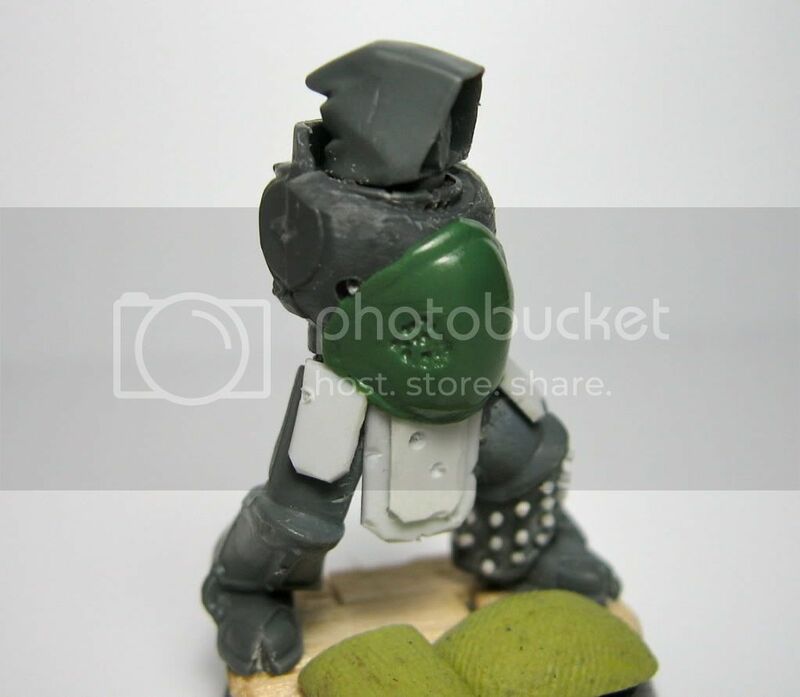 I added two resin shoulder pads to tie them in and sculpted the belly guards to fit the bloated aesthetic. I am pleased with the bulk of these models. 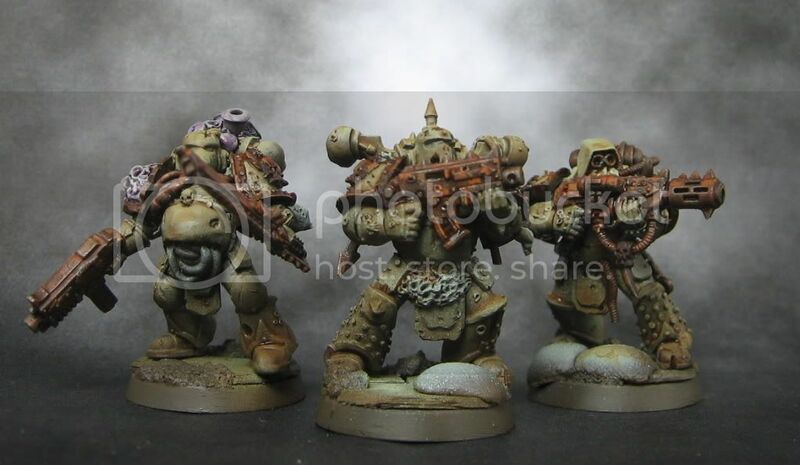 I think they look suitably intimidating to fit in with the Death Guard. I carried over a few themes from the other models that I am planning to carry through the army (fungus chimneys, bloated stomach armour, tentacles, metal tabard, cables). I've also started assembling and sculpting a few terminators. I have the Forge World Death Guard terminator torsos. 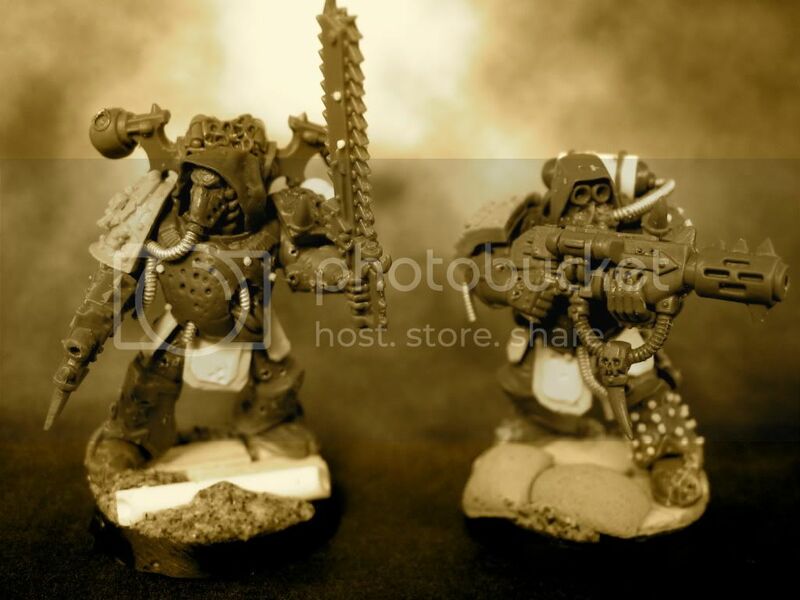 The legs I have here are from Grey Knights. I have some more terminator bits and pieces coming to build a solid contingent of them. 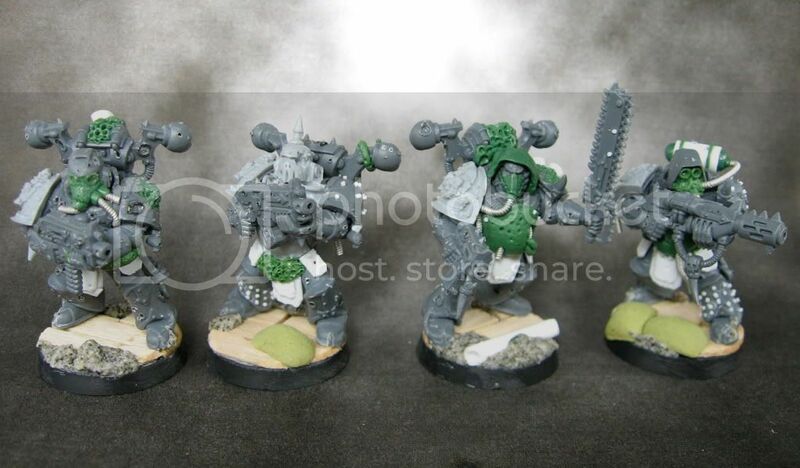 All of the terminators will be magnetized so I can swap weapons around.